Author Peter V. Brett writes on the Subway. In an interview recently, he explained it: “I write on Docs to Go on my iPad. It syncs wirelessly with my desktop, and I work in Word there. Shift back and forth constantly. Always, always music, though selections depend on my mood. I like to write on the subway. It is peaceful when the internet goes quiet. Takes getting used to, but now it is very natural. Anywhere I can put on headphones and not be bothered by anyone for thirty minutes or more works now.” So he wrote The Warded Man aka The Painted Man on the ‘F’ train riding from his home in Brooklyn to Time Square where he worked in medical publishing. Using his HP Ipaq 6515, a phone similar to a BlackBerry, he f0llowed up with another book before quitting his day job to write full time. 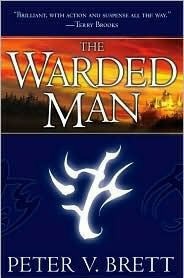 Released as The Painted Man in Great Britain in 2008, Brett’s debut novel, The Warded Man, arrived from Del Rey Spectra in 20o9, and went on to sell 100,000 copies in 17 countries. 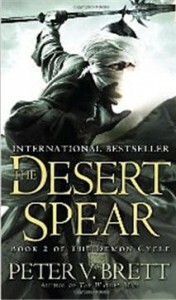 The follow up, The Desert Spear, released in 2010 and is currently on bestseller lists. Four books are planned altogether in this Demon Cycle series, with the next chapter, The Daylight War, scheduled for a February 2013 release. “Demon Cycle was always planned as a quintet, though I have novellas and at least one standalone book planned for after, Brett said. Now, the producers behind the Residential Evil Hollywood films franchise have taken an interest, calling a planned trilogy “the next Lord Of The Rings.” Brett has signed a lucrative deal and discussions and plans are underway to start filming later this year. British producer Jeremy Bolt said the first film would have a budget of up to $100 million and be shot in 3D with director Paul W.S. Anderson attached. He couldn’t believe the book was typed on a phone. The story of a land where demons called “corelings” emerge at night from the earth to feed on humans and a man who uses spells tattooed on his skin to ward them off, the books are epic in scope with multiple POV characters and a large world and canvass. Brett continues to write on his phone on the subway when he needs inspiration.